If you have noticed that YouTube seems faster and more responsive when using Google Chrome rather than rival browsers such as Mozilla Firefox, Microsoft Edge or Apple Safari, you aren't the only one, thankfully. Mozilla Technical Program Manager, Chris Peterson, commented on this eyebrow raising phenomena earlier this week and has suggestions for users wishing to do something about this issue. Before we go on to remedies, it is worth looking at the cause of the performance disparity - which makes Google Chrome look like the best browser for watching YouTube. Peterson explains that "YouTube's Polymer redesign relies on the deprecated Shadow DOM v0 API only implemented in Chrome". 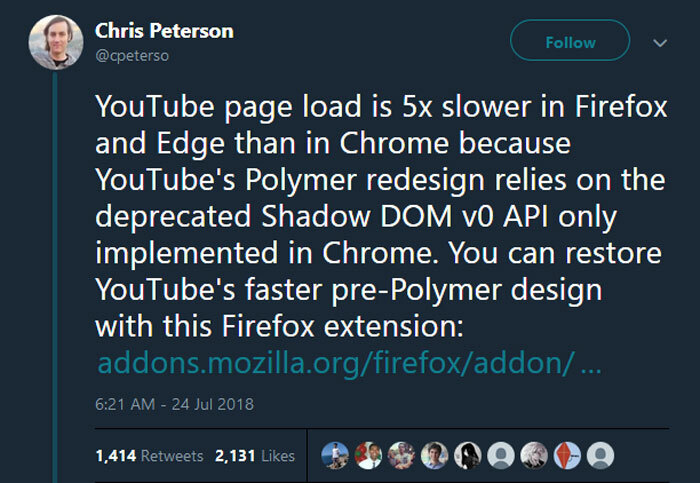 Discussing the impact of the Google / YouTube policy Peterson added that "YouTube serves a Shadow DOM polyfill to Firefox and Edge that is, unsurprisingly, slower than Chrome's native implementation. On my laptop, initial page load takes 5 seconds with the polyfill vs 1 without. Subsequent page navigation perf is comparable." You can restore YouTube's faster pre-Polymer design in Firefox with an extension called YouTube Classic. Alternatively, if your browser of choice is Microsoft Edge or Apple Safari you can load a custom Tampermonkey user script to get the classic design - and faster speeds. If you don't browse YouTube using Chrome and make the above suggested 'speed up' changes in your browser of choice, there are some drawbacks to consider. Firstly, you will be reverting back to the old YouTube site design. Secondly, if you like using the built-in YouTube dark mode, it won't be available to you anymore. I kind of noticed a YT video taking much longer to load in Firefox this morning than Chrome and was wondering why!! If this went beyond “Oh noes, I had to wait an extra 4 seconds for youtube to load! !” I'd be more upset. The thing with deprecated APIs is that they used to be active. If non-Chrome browsers don't support it natively it's because they never bothered implementing it even when it was active. If YouTube served a polyfill to competing browsers regardless of native support for an API, that'd be shady. If YouTube used an undocumented API that competing browsers simply couldn't run or implement, making it non-functional on browsers other than Chrome, that'd be extremely shady (and, in fact, genuinely IE6 all over again). But using an open-source, well-known API that they know is faster on their own browser because of work they've done implementing it natively; using an API that Chrome is known to have a native implementation for … I'm sorry, but I just can't get worked up over it. Think the issue here is that it's unnecessary and petty. Seems to me if there is a Polymer 2.0 or 3.0 which all browsers support they would move to it if they were being mature. This isn't an incentive to install Chrome, for me, and it won't be for the vast majority of Firefox/ Edge / Opera type people who used those browsers because they already object to Chrome. It may, however, be minor incentive to leave behind the slowly disintegrating Youtube platform. Been noticing youtube be ‘slower’ for a while in all honesty and I use firefox. The issue with using a ‘native api’ is that in this case the api is deprecated due to newer versions and it's likely going to cause the same situation we had with internet explorer where people will require optimisations for specific browsers rather than the ‘standardised’ way it had been going before Google started leveraging it's ‘position’. This could be seen as anti competitive as well imo because this will drive users to chrome and because it tracks you (is it still there, I try not to use chrome) it's more ‘advertising data’ for google etc.